I have been playing around with the sewing machine decorative stitches. I went and looked through some of my recent pattern purchases from the last couple Joann’s pattern sales. I wanted ones with style lines that could be enhanced with decorative stitching. I brought out these patterns for shirts to wear with jeans. One is a jacket, but I planned on cutting/sewing it as a shirt. Today I am going in to the mac store for a class. I need to learn about making calendars and linking them to a database of students for the sewing class I start teaching in August. I thought why try and figure everything out myself when I signed up for a year of computer classes. 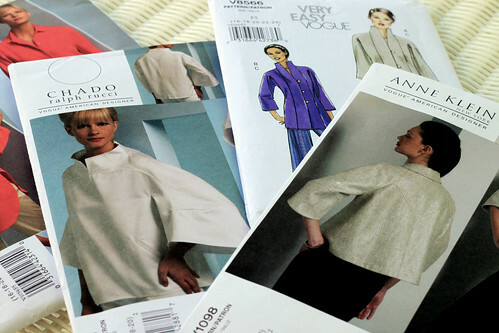 I also want to make a database of all my patterns, but there is probably no easy way to do that with the 30 years of pattern sale purchases in the closet. This entry was posted on Sunday, July 12th, 2009 at 3:00 am and is filed under Sewing. Tagged: Sewing. You can feed this entry. You can leave a response, or trackback from your own site.